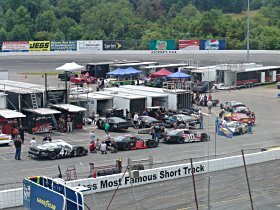 Trackside Now: PASS South "Independence 150"
Sunday - 9:40pm ET - That is it from Hickory Motor Speedway. Speed51.com will have more on this event, including driver reaction, later this week. We hope everyone had a safe and happy Fourth of July weekend. 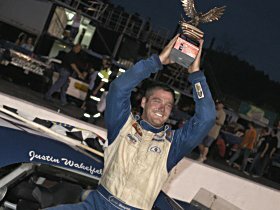 Sunday - 8:51pm ET - Justin Wakefield has won the PASS South Independence 150. We will have more shortly. Sunday - 8:47pm ET - The officials are taking a bit of time here to make sure all cars are in the right spots. Sunday - 8:46pm ET - YELLOW FLAG LAP 145: On the restart, Preston Peltier got the jump, but Ryan Blaney quickly dove to the inside coming off turn two. They went side by side through three, then the two drivers made contact off turn four, sending Peltier into a spin. Blaney cut a tire down in the process and had to head to the pits. Johanna Long, Heath Hindman and Jeff Choquette also spun on the front stretch. Peltier attempted to lobby for his spot back up front, but has been sent to the rear as there isn't a "protect the leader" rule in PASS. Sunday - 8:40pm ET - YELLOW FLAG LAP 144: Johanna Long spun off turn two. Jeremy Frankoski also spun, but it didn't appear to be contact with them. This will be interesting. Preston Peltier and Ryan Blaney will be restarting side by side, and this year they have had some run-ins. Also, at Greenville just two days ago, we got to this point and couldn't get the race completed because of yellow-flag fever. Will we see a repeat of that tonight? Sunday - 8:37pm ET - With 15 laps to go, Ryan Blaney has moved into second, but Preston Peltier has a healthy lead. Unless he gets held up, breaks or a caution comes out, it is Peltier's race to lose. WIth 10 laps remaining, the top five is Preston Peltier, Ryan Blaney, Devin Jones, Justin Wakefield and possibly Trey Mitchell. 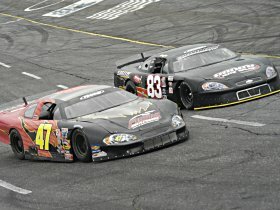 Sunday - 8:33pm ET - At lap 124, Preston Peltier worked under and by Justin Wakefield for the lead. Ryan Blaney is trying to reel in the top leaders. Sunday - 8:32pm ET - Justin Wakefield held onto the lead on the restart with Preston Peltier dropping behind him in second. Meanwhile, Devin Jones has worked his way around Ben Rowe for the fourth position behind Ryan Blaney. Also, Michael Pope, who has been on and off pit road multiple times during the race, has moved into 10th behind Johanna Long. Sunday - 8:28pm ET - YELLOW FLAG LAP 113: Justin Wakefield got the jump on the start, but behind him going into turn one, a few cars got together, which put Jeff Fultz up towards the wall and had Joe Winchell going for a loop in the turn. All pulled away from the incident and Ben Rowe has been on and off pit road. Up front, Justin Wakefield lead Preston Peltier, Ryan Blaney, Ben Rowe and Devin Jones. Sunday - 8:23pm ET - YELLOW FLAG LAP 113: Billy Leslie has spun in turn one to bring out the yellow. Sunday - 8:21pm ET - Alex Fleming has now made his way down pit road, nosing into his pit area. Sunday - 8:20pm ET - Bradley McCaskill has pulled his car to the pits and nosed in to his stall, so it appears he is done for the race. Sunday - 8:18pm ET - As we reach the 100-lap mark, Preston Peltier still leads the field as he is now working heavy lapped traffic. Justin Wakefield still runs second with Ben Rowe third. Jeff Fultz is fourth with Ryan Blaney fifth. They have put Billy Leslie back to sixth with Corey Williams seventh and devin Jones eighth. Sunday - 8:12pm ET - Preston Peltier once again held the top spot with Justin Wakefield riding second. Ben Rowe has settled in third with Billy Leslie running fourth. RIght behind Leslie is Ryan Blaney, who is looking to move forward. There are 85 laps on the board. Sunday - 8:08pm ET - YELLOW FLAG LAP 71: Cassius Clark slowed on the track and was just about on pit road, but the leaders were coming up on him, precipitating the yellow flag coming out. He had a right rear tire go flat, so his team has changed that and he is back on the track. Sunday - 8:05pm ET - YELLOW FLAG LAP 68: Ryan Blaney, running up around the third spot, went sideways, possibly from contact, in turn four. Multiple cars spun, but everyone got away. Devin Jones and Johanna Long are two of the drivers that got a piece of it. Michael Pope was just on pit road to put the hood back on. It has been a crazy last few moments. 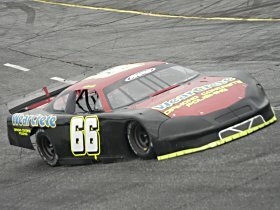 Sunday - 8:02pm ET - YELLOW FLAG LAP 67: Jeremy Frankoski has looped his car in the middle of the backstretch. Sunday - 7:55pm ET - Preston Peltier held serve up front, but a few laps after the restart, Devin Jones worked his way to second around Heath Hindman. Jones is reeling in the leader. Zach Stroupe has joined Jay Fogleman and John Stancill on pit road. Sunday - 7:53pm ET - GREEN FLAG: Preston Peltier and Heath Hindman head towards turn one. Sunday - 7:49pm ET - YELLOW FLAG LAP 40: Johanna Long has spun in turn four. Everyone avoided her car, including Jeff Fultz, who went down pit road to miss her. Sunday - 7:48pm ET - Preston Peltier has taken the lead on the restart. Sunday - 7:47pm ET - GREEN FLAG: Heath Hindman and Preston Peltier head to turn one. Sunday - 7:45pm ET - YELLOW FLAG LAP 38: Jay Fogleman stopped on the track going into turn one to bring out the yellow. We are hearing he might have a broken shock. Sunday - 7:40pm ET - Heath Hindman got the jump on the start and currently leads. Cassius Clark is now running second with Devin Jones in third. Justin Wakefield has just worked his way around McCaskill for the fourth position. There are 24 laps on the board. Also, all cars that were on pit road made it back on the track before they got back going green except John Stancill, who still sits on pit road with the hood up. 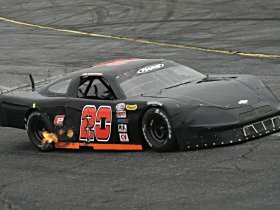 Also, we heard that Jeff Fultz might have been docked a lap for bringing out the yellow (stopping on the track), but we cannot confirm that. Sunday - 7:38pm ET - GREEN FLAG: Heath Hindman and Bradley McCaskill head to turn one. Sunday - 7:37pm ET - YELLOW FLAG LAP 14: Jeff Fultz, who was running in the top five, slowed on the track in turn two to bring out the yellow. He has made it to pit road and the team is looking under the rear of the car. Also, the #51 of Michael Pope and the #48 of John Batten have also pitted. During the yellow, John Stancill slowed and is on pit road. Sunday - 7:34pm ET - Bradley McCaskill got the lead on the start and held the top spot for the first five laps, but Heath Hindman has passed McCaskill for the lead, dropping him to second. Justin Wakefield rides third with Cassius Clark and Jeff Fultz running in the top five. Sunday - 7:31pm ET - GREEN FLAG: Bradley McCaskill and Heath Hindman take the field under the flagstand and towards turn one. Sunday - 7:29pm ET - The cars have been fired and we are moments away from the start of the event. Sunday - 7:19pm ET - Jody Measamer and Grant Davidson went side by side coming out of turn four, heading to the stripe to complete the PASS Truck Series race. Measamer, who was the leader coming to the white flag, was able to hang strong on the outside to win the feature. The PASS Super Late Model Independence 150 is next. Sunday - 6:50pm ET - Due to technical issues, the race will not be broadcast on RaceTalkRadio.com. We apologize for the inconvenience. You can follow the action here instead on Trackside Now. 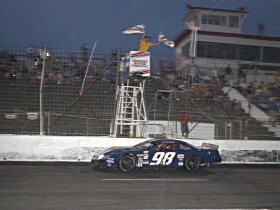 Sunday - 6:48pm ET - Justin Allison won the Allison Legacy race. Timmy Hill was second. The truck race is next. Sunday - 6:12pm ET - Qualifying for all divisions has been completed and the first race of the night is up next .. the Allison Legacy Series event. There are 16 cars lined up on pit road, ready to rock and roll. Sunday - 5:30pm ET - Here are the results from Super Late Model qualifying. 11th - 25th are set by time, but the top 10 will redraw for their starting position. 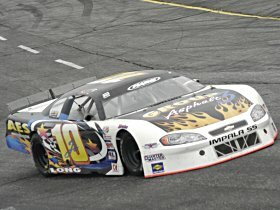 Sunday - 5:25pm ET - Justin Wakefield has set fast time for the PASS South Super Late Models. The full qualifying results will be coming shortly. Sunday - 4:38pm ET - Practice has concluded here at Hickory Motor Speedway. If we are able to get some times, we will post them. Sunday - 4:05pm ET - Chase Pistone is here with John Stancill, and he brought along his Father's Day gift. 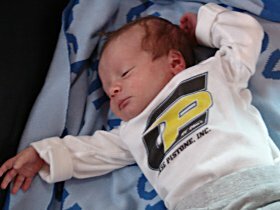 Pistone's son Carter Chase Pistone was born on Father's Day, and is here at the track supporting his father from their toter home. Sunday - 4:00pm ET - Chris Ragle from Pro Photo Productions heard a rumor about Ben Rowe, so we checked it out. Gary Crooks is here working with Rowe, and the rumor was that Crooks was going to house or work with Rowe for the remaining South events that his north Richard Moody team isn't pulling down for. Rowe told Speed51.com that nothing is set in stone and they really haven't discussed it, but he didn't dismiss it either. Sunday - 3:55pm ET - We talked to a few drivers inbetween the practice sessions to see how they are doing. Preston Peltier didn't have much to say, but what he did say might be trouble for the rest of the group. He said his car was awesome and had a big grin. Speaking of a big grin, it is hard to get Heath Hindman to smile, even when he wins a race, but after the first practice session, he was smiling. He said the Greenville race was the most fun he has had in a car in a long time and said his car is good here today. Cassius Clark's car is all back together after wrecking with Spencer Wauters at Greenville. Clark said that his crew worked all yesterday putting it back together. He said his crew was made up of all Canadians, so it didn't bother him that they worked on the Fourth of July, because, as he said with a smile, "it wasn't their holiday." Michael Pope said his car was awesome. He said he was able to lay down some good numbers on old tires, so he is happy. Ryan Blaney said his car was good, but was just a bit free. His team will be working on that for the last rounds of practice. 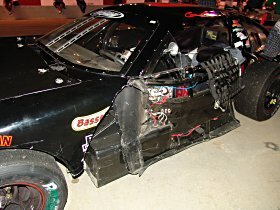 Bradley McCaskill has his car here after wrecking it a few weeks back at a local Concord Speedway (NC) event. He said his car is good, but loose when they were trying some stuff for qualifying. John Stancill said they are also good, but right now working on making sure the car stays consistent over time on worn tires. Jay Fogleman, fresh off his win at Greenville-Picks two days ago, said he has made some adjustments to his car and hopes he made the right decision with them. Ben Rowe said his car is way too loose, and is not sure what if anything they are going to do to it. After running out of fuel while leading in the late laps at Greenville, Jeff Choquette said the team has dropped a 22-gallon fuel cell in it for tonight's race. Justin Wakefield is fighting a problem that normally isn't an issue - too much power. On this track, having a big motor can be a disadvantage. 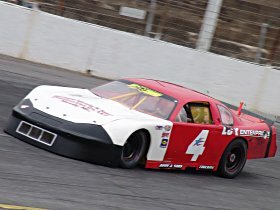 Sunday - 3:45pm ET - Practice continues here at Hickory Motor Speedway. Despite an overcast sky, everything looks good at this point, so we are very optimistic the race will get in. If you are in the Hickory area, make sure to come down and watch this event live. After Greenville's barn-burner, it should be a great race to attend. Sunday - 1:58pm ET - Practice is supposed to start shortly, but it might be slightly delayed due to the cars still going through the tech line. We are heading trackside and will have updates soon. Sunday - 1:50pm ET - We checked with a PASS official, and the current unofficial count is 26 cars here. There were about five cars that were at Greenville-Pickens that are not here today. Sunday - 1:25pm ET - After Friday's races, we aren't sure yet who has made it here and who has not. There were some torn-up cars after the multiple restarts late in the race. One driver we shouldn't see here is Dean Clattenburg. After a strong showing, Clattenburg got in a wreck that tore up his car. After the race, we spoke to him and he said that he will have to clip the car as well as other things, and due to scraping up every penny he could just to get it running for that race, Clattenburg said he is probably done racing now for the season unless he can find some cash to get him back to the track. There are some drivers though that are here that were not at Greenville, including John Stancill, Michael Pope and Devin Jones. We will try to get a full roster of drivers, but might not have that up until after practice. Also here today that weren't at Greenville are the PASS Trucks. Pro Challenge Series graduates Clint King and Meghan Dillner are among the drivers that will be battling for the win in their feature tonight. Dillner won her first Pro Challenge Series race here last week. The Allison Legacy Series will round out the three-series features tonight. They will actually take to the track first, followed by the Trucks then the Super Late Models for feature time. 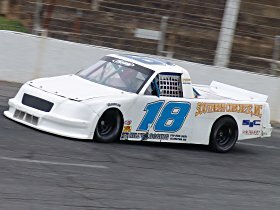 Sunday - 1:20pm ET - If you happened to miss the action two days ago at Greenville-Pickens, make sure to check our Trackside Now coverage of the event by clicking here. Also, tonight's event will be broadcast live on RaceTalkRadio.com. The current plan is for us to cover the day's activities here on Trackside Now, then switch to calling the race live on RTR, then coming back to post the finishing results and any other post-race tidbits. Sunday - 1:15pm ET - The weather is a bit different from the Greenville-Pickens Speedway (SC) race two days ago. While it was sunny and hot in South Carolina, here today in North Carolina it has cooled some and the skies are overcast. There is a 50-percent chance of rain showers for the area throughout the day, including right now. A few sprinkles were felt just a short time ago, but they stopped as quickly as they started. Currently, the radar shows everything to the west or south going east, so we are very optimistic that the racing action will take place today. Sunday - 1:05pm ET - While you read along here, you can discuss the events in the Speed51.com Short Track Discussion Forum at Motorsports Lounge by clicking here. The PASS South Super Late Models are going through the tech line prior to the first practice session of the day. Cassius Clark's car was one of many that were torn up at Greenville-Pickens just two days ago. Corey Williams (#47) and Jeff Choquette (#83) side by side. Carter Chase Pistone is here supporting his dad Chase as he works on the #20 of John Stancill. Michael Pope said his car is "awesome." Johanna Long is hoping to have a better finish than she did at Greenville on Friday. A flame pops out of John Stancill's car as he enters the corner. Meghan Dillner is here in a PASS Truck after winning at this track in the Pro Challenge Series last weekend. Jeff Fultz is here in his #66 machine. Ben Rowe is here with Gary Crooks working on his car. Justin Wakefield in victory lane. 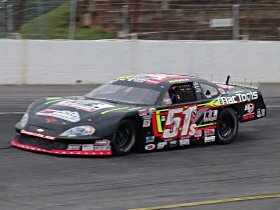 Crossing the finish line first, winning the Independence 150 PASS South Super Late Model event, was Justin Wakefield.